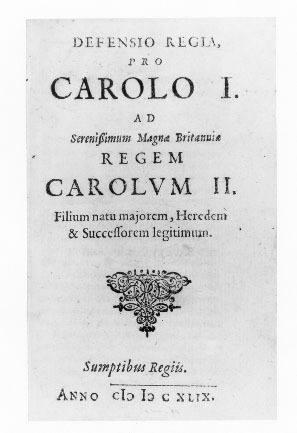 Title-page of the Defensio Regia (Amsterdam, 1649) by "Claudius"
Commisioned by the administration of Charles II, this controversial royalist work (710 pages) in defense of the administration of Charles I was written by Claude de Saumaise (1588-1653), a distinguished French scholar in Leiden. It displays a typographical title-page mark (Jansson 189) of striking simlarity to the mark on the title-page of Female Poems...by Ephelia (London, 1679). In selecting a mark of this particular class for her own book's title-page, the Ephelia poet (Mary Villiers) may well have been exploiting the graphic medium to allude to this earlier pseudonymous book of 1649, thus cleverly asserting her solidarity with Saumaise's book and the Stuart monarchy it defends. In bold political broadsides (1678, 1681), Mary Villiers was an ardent Stuart apologist; she also was the wife of a Stuart and an adopted ward of the Stuart court. Thus, the title-page device of Ephelia's book, in addition to its suggestion of a butterfly and swords, may carry strong political content. New York Public Library copy of the Saumaise (Rare Books & MSS Division). With kind permission of the Office of Special Collections, New York Public Library, Astor, Lenox and Tilden Foundations.